Here are the Pictures from this year's St. Patrick's Day parade. Please click on the image to be directed to our web album. County Laois will assemble at 2:40pm on Saturday, March 17th at our usual location outside 48 West 48th Street, between 5th and 6th Avenues. We follow Co. Meath and are ahead of Co. Wicklow. We are delighted that Tom Lawlor, a distinguished past President of the Laois Association (NY) (1967 - 1985) as well as serving briefly as Chairman of the Laois GAA Club (NY), has accepted the honor of being this year's Co. Laois Grand Marshal to lead us up Fifth Avenue. Tom, who now resides with his wife Brigid (formerly Kennedy and a nurse also from Laois), in Abbeyleix Co. Laois, returned to Ireland in 1985 where he purchased and worked a farm until his recent retirement. Tom's story is an inspiring one. Born and raised in the Shanahoe area of Abbeyleix, he emigrated to New York soon after graduating from High School. On completing service with the army's 82nd Airborne Division, Fort Bragg, Tom joined the NYPD for the next twenty years before retiring in 1985 with the rank of Detective. In the meantime he also graduated　from NYIT with a degree in Criminal Justice. Tom and Brigid's two children have followed all of their parents drive: Daughter　Sheila is a Trinity College Law graduate who works in Dublin, and　son Garrett　is a UCD Medical school graduate who is　now an Assistant Professor of Medicine at SUNY Downstate. Tom will receive the Laois Grand Marshal sash from Hugh McEvoy, last year's Grand Marshal, at the beginning of the Parade for the duration of the 2012 season. Congratulations Tom. The St. Patrick's Day Committee awards scholarships to High School and College students each year. 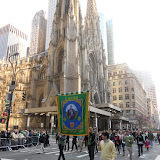 For rules and　application forms go to www.NYCStPatricksParade.org　and click on "Scholarship" (lower right). The deadline is April 2, 2012. Once again Parade Chairman John Dunleavy requests that all marchers observe the appropriate dress code. That is, as he puts it, "our Sunday Best" with zero tolerance for sneakers or jeans. (1) Saint Patrick's Day　Parade　official　website: www.nycstpatricksparade.org. (2) Also see the Co. Laois Association Blog site link: www.nylaoisassociation.com for updates and last year's photo gallery. Contacts: Mike Dunphy, phone (732) 292-0277, e-mail: mike.dunphy@att.net. Larry McEvoy, phone (917)833-3218, e-mail: lmcevoy@aol.com. Bill McEvoy, who is now in his 90th year, will once again join us on the parade. Is Bill the oldest marcher in the parade? Bill, a founding member and leading spirit of Ceoltas Ceoiltori na hEireann, will return to Long Island after the Parade to ring out the day’s festivities by playing in his band at two separate functions before calling it a day. Bravo Bill. Laois Association member and Irish novelist Tom Phelan will be at the King's Lynn　Fiction Festival in Norfolk, England, the weekend before St. Patrick’s Day talking about his latest novel, Nailer ,which targets decades of abuse of Ireland’s most vulnerable citizens. The novel is available at www.tomphelan.net and amazon .com among others. Books Ireland　calls Nailer "a hard-hitting thriller," and the Leinster Express　says it's "a compelling story." On Thursday, 29 March, at 9:30 a.m., Tom will speak about Nailer and read selections from it at the Hofstra University Irish Studies Program, Davison Hall (south campus), room 104. Many of his books are now available as e-books on the Kindle. While the Association has its blog site (see over page) put together by Stephanie and Cormac McEvoy, we would like to have a web site again and thus would greatly appreciate it if anybody can help with their expertise. The Lawlors are one of the "Seven Septs" or Clans of Laois and their web site is : www.oleathlobhair.com. President Mike Dunphy has a limited number of Grand Stand tickets available if anybody is interested. He can be contacted at 732-292-0277.